Monkeys on a Mission of Love! 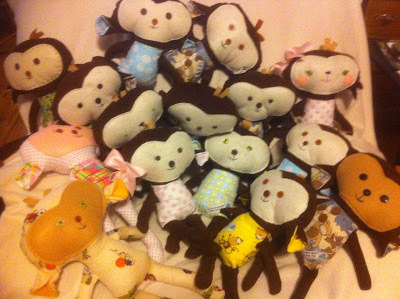 Mary has sent 15 beautiful handmade Monkeys on a Mission ... a mission filled with lots of love, cuddles and joy!!!! She found me through my Dolly Donations page, and I am so glad she did! These adorable snugly softies are on their way to children in Honduras right now!!! Hooray!! Thank you for sharing the photo with me Mary! And well done on a fabulous idea! I love them!!! If you send a Monkey on a Mission do let me know! Oh my goodness Mary just posted this!! Awww it really made my day! The Monkeys arrived safely ..... and...... 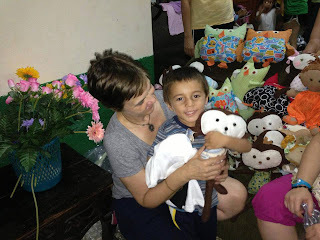 This little boy is loving his New best friend !!!!! !